Since the original launch of the Sloan Digital Sky Survey (SDSS) in 2000, the data from the project has been released to the public on a timescale of every year or two. These Data Releases include both new observations from the telescope, as well as refinements to old data based on improving the processing and reduction routines. Today, Sloan announced that Data Release 10 (DR10) is now available to both the general astronomy community and to the public. It contains the first release of spectra from the APOGEE experiment, which has been observing tens of thousands of red giant stars in the Milky Way. It also includes new data from BOSS, which has been measuring redshifts for distant galaxies in order to measure cosmological parameters and study structure formation. The original data from Galaxy Zoo was included in the SDSS Data Release 8. That’s quite important for a couple of reasons. It makes it much easier for scientists to use the GZ data, since SDSS uses this as the input for their own database, called CasJobs. This database enables matching of morphologies to other properties of the galaxies that SDSS measures, such as color or size. It also provides one of the main means of access to the data for people who aren’t members of the Galaxy Zoo team. Finally, it’s a validation that your GZ classifications have become a core data product of the survey, and something which is worth preserving and sharing as widely as possible. In DR10, we’re happy to announce that data from Galaxy Zoo 2 is available for the first time. The reduction and description of the data is covered in a recent paper, which received a very favorable referee report a couple of weeks ago and will be resubmitted soon. We’ll share the paper as soon as it’s been formally accepted. The GZ2 data will also be hosted on our own site within Galaxy Zoo in the near future. Galaxy Zoo 2 data is now on CasJobs! Please check out DR10 if you’re interested in peeking at the GZ2 data – do acknowledge both Willett et al. (GZ2) and Ahn et al. (DR10) if you end up using it, though. Congratulations to the SDSS team on this new release! In the DR10 Explore tool, under Imaging Summary, there’s an item “Galaxy Zoo”. I’ve tried clicking this, for quite a few objects now, but each time I get an error. Do you know what this should link to? The link here isn’t working for me – I’m getting runtime errors from SkyServer, which I suspect means that they’re having problems with their site. I’m trying to contact people and send in bug reports now. Thanks. Whatever you did, it worked. And I can see that it gives you access to ALL Galaxy Zoo data, for the object. Awesome! You’re correct – DR7 spectra is not the sole reason for inclusion in Table 3 (although it is the main reason). I don’t think the text here is explicitly wrong, but it does leave out a couple details as previously discussed on the forum. I hope the detailed description in the paper will serve as explanation for the non-biased corrections. The naming of the tables wasn’t the best choice, but I think it’ll be quite difficult to change those at this late date. Not all Stripe 82 co-adds we classified in GZ2 are in SDSS DR10? SDSS J232412.38-000050.0 (link takes you to the DR10 Explore tool page) is an object whose Stripe 82 co-add images we classified (see this GZ forum post by Ioannab for two versions). Yet clicking the “Galaxy Zoo” link on the SDSS DR10 Explore page brings up a page with only a GZ1 entry; “No data found for this object” it says, for all GZ2 categories! That galaxy is in the DR10 CasJobs data – there appears to be some disconnect with the objid that Skyserver is searching on, though. I’ll forward this to the team and ask for their help. Thanks for the query. There will be a few galaxies from the Stripe82 coadds that don’t appear in DR10, BTW, primarily those without spectroscopic redshifts. It’s not just that particular galaxy/object; that’s just the one for which I could – fairly quickly – get convincing evidence of a mis-match (i.e. discussed in the GZ forum, in DR10, has a spectrum, …). I found quite a few others that are certainly in Stripe 82, are (almost) certainly in the GZ2 Stripe 82 co-adds, has an SDSS spectroscopic redshift, and for which the DR10 Explore tool page says does not have a GZ2 entry. 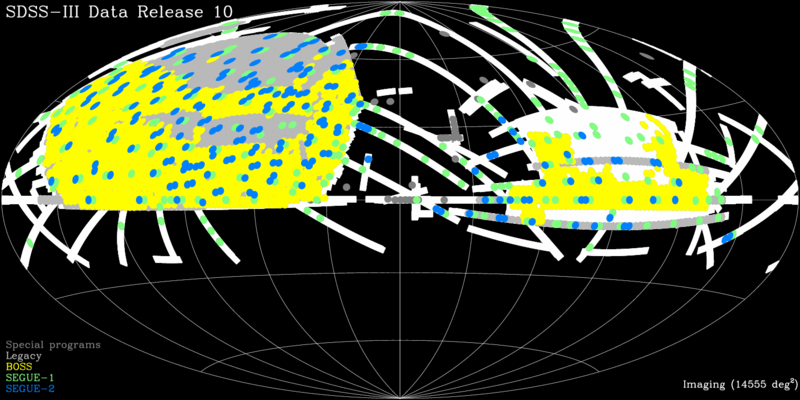 Yes – a small number of galaxies are currently missing from the Explore tool. This isn’t because those classifications don’t exist – as I said above, they’re in CasJobs and are part of the main GZ2 release. The reason they’re not showing up in Explore is because we couldn’t find a 100% match between the IDs used in the various SDSS data releases. The GZ2 data is all from DR7 – between DR7 and DR8, however, SDSS switched to a new ID format to identify galaxies. In almost all cases, there is a clear mapping between DR7 and DR8 and we were able to recover the new ID. There are a couple of exceptions, though – sometimes an observation is withdrawn as a galaxy, and for dense fields or resolved galaxies there can be confusion as to the central source. (cont.) For the three normal depth GZ2 samples (zoo2MainSpecz, zoo2MainPhotoz, and zoo2Stripe82Normal), we found matches for >97% of the galaxies in our sample. For the coadded catalogs, the matching ratio was worse – 12-13% of galaxies didn’t come up with a dr8objid match. Since the dr8objid is what the Explore tool searches on, they don’t appear, even when you use RA/dec or some other way of finding your galaxy. I’m working with the SDSS team to find the best way of improving our matches in the catalog. In the meantime, if you’re interested in a particular galaxy that doesn’t appear in the Explore tool, try CasJobs – I know it’s much more of a pain, but the data should be there. 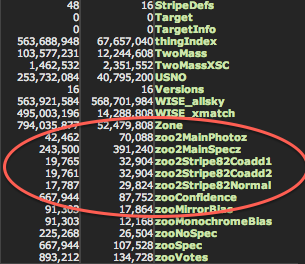 Related question: how do you find the GZ2 co-add image, or images, of a Stripe 82 object (having first determined, somehow, that such an image exists)? Hi. I’m looking at galaxies producing stars with ew(Halfa) between 30 and 300Å (in SDSS) and some other parameters. I’m also comparing them with their data in galaxyZoo. Unbiased and oddness>0.8. BUT the result is somewhat strange. I was expecting “odd” looking galaxies since this would comply with the Zoo classification. The 384 galaxies that I get are (most of them) not looking odd at all. So something seems not to be right. Any suggestions???? “Oddness” can mean many different things in the context of the Galaxy Zoo data. Without specific examples, I would suggest looking at what the most common reply to the odd question was (eg, was it a dust lane galaxy? a merger? a gravitational lens?) and then look at the examples in each of those sub-categories. and I first went for this to be more than 0.8 but then the galaxies looked pretty “normal”. Now I tried to tip the scale and went for those larger than zero but less than 0.11. Lo and behold…..NOW they look odd! Tails and mergers! Have you by any chance turned the scale upside-down????? I sincerely hope not, but anything’s possible. Can you send me specific examples (with SDSS IDs and the debiased classifications)? Will follow your advice, but I’m still a bit concerned over that I got plenty of “odd” galaxies when selecting the lower range. This is the SQL that I ran. We had expected somewhat disturbed galaxies due to our selection criteria. So that is why we got suspicious. Then changed the interval for zo.t08_odd_feature….. to between >0 and <0.11 and suddenly we saw the galaxies we had expected from the previous run…. The reply field removed a part. The text above should be added to the SQL…. Less than and more than signs truncate the message. The text above should be added…..
I’ve repeated your search, and I think I see the issue. There are two strong things I would change for what you’re trying to do. 1. The “disturbed” category is not particularly representative of merging galaxies; this was mostly due to a badly designed icon for the project. I strongly suggest using a combination of “irregular” and “merging” (and possibly “other”) as the responses to Task 08 if you’re looking for morphological disturbances. 2. It’s not sufficient to do a simple vote fraction cutoff for morphology, especially for a feature (like disturbed galaxies) that’s deeply embedded in the decision tree. The reason is that vote fractions are computed with respect ONLY to other responses to that task. Here’s a contrived example: say a galaxy had 100 people classify it in total, and that 99/100 thought there was nothing odd about it, and responded “no” to Task 06. The last person answered “yes” to Task 06 and then chose “disturbed” for Task 08. The vote fraction for Task 08 is now 1.0 (100%), because it’s computed as (number of responses for disturbed) / (total number of responses to Task 08). So if you’re just looking at a single response, you can get extremely variable vote fractions based on small-number statistics. That’s what’s happening for your galaxies; most only have 1 or 2 responses to the “anything odd” question but those who did selected “disturbed” as the odd feature they were looking at. However, the vast majority of classifiers didn’t think there was anything odd at all, and so never even answered Task 08. This ensures that the majority of the classifiers _answered the question_ that you’re concerned with, and that you have enough votes to make the fraction statistically meaningful. If you don’t do that, you’re not accounting for all the classifiers who (implicitly) vote against that morphological feature being present, since they chose a different path where this feature isn’t relevant. Table 3 in Willett et al. (2013) has suggested cutoff fractions for the entire tree, but you can explore your own subsamples and set them where appropriate. With the zo.t08 I do not get anything at all. But using only zo.t06…..gt 0.8 together with my other search criteria leaves me with about a 1000 galaxies.And they are really disturbed! Any comments??? They’re supposed to be disturbed, aren’t they?